"There's A Stream On That Mountain"
"There's a stream on that mountain" that's what I said to Jeanette as we were walking one day last week. Yesterday I found that stream as well as another little blue line that runs very close to it. The morning broke clear on a day that was to turn hot and a bit on the humid side. The last few days had been very comfortable and I was anxious to test this new stream. The moon was full and just loosing that brilliant shine as I was heading up the mountain. As I crossed a very weathered old iron bridge that crossed a stream I was greeted buy a very large group of turkey's, they had just flown down from their roost and seemed to be getting it all together. There were lot's of little ones and a few mother hens trying to get some order in place. The wild world in the morning is so wonderful. Well I finally found a little cut-off along the road where I could park. The stream was close and I could hear the water flowing. I geared up and started my way for the sound and eventually the stream. The first place I saw was a nice run with a deep pool. The stream was in super shape. The first cast produced a nice swirl behind the fly just at the surface. The second cast produced this fine male brook trout. His colors were that of an autumn fish, and he had what was the start of that hook jaw. When I brought that first fish to hand the water felt pretty cold. I reached in my pack and retrieved my thermometer. Placing it in the water and checking I was pleased to see a 57 degree temp. I continued to fish up and down the stream. Beautiful runs and pools along the way. Some of them quite easy to fish and some downright nasty. I took my share of strikes and many a miss. But I am happy to say I connected several times and was rewarded with spunky wild trout. This was the pool of the day. It is where I had my lunch and just listened to the sounds of this wild spot. The water was insanely clear and I could not see a fish, but I just knew there had to be one there. 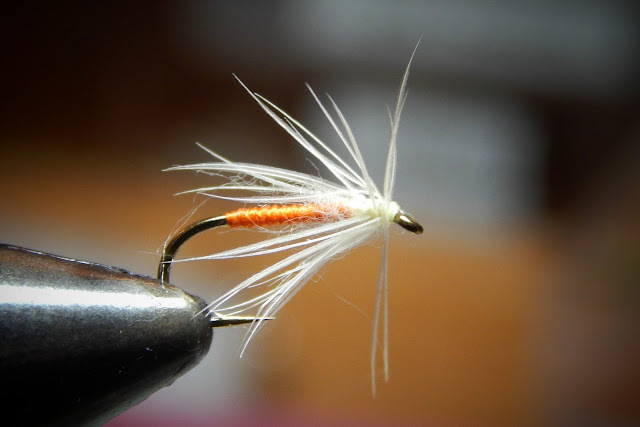 A classic New England stream and a classic New England fly was in order. I tied on a "Bomber" and cast it near the boulder. A few inches of drift and a violent rise. The fish was on and he did not want to surrender. Several leaps and a few strong runs and he was about to come to hand. I placed my hand under his belly and gently lifted him up. If this was to be the only fish I took today I would be well satisfied. 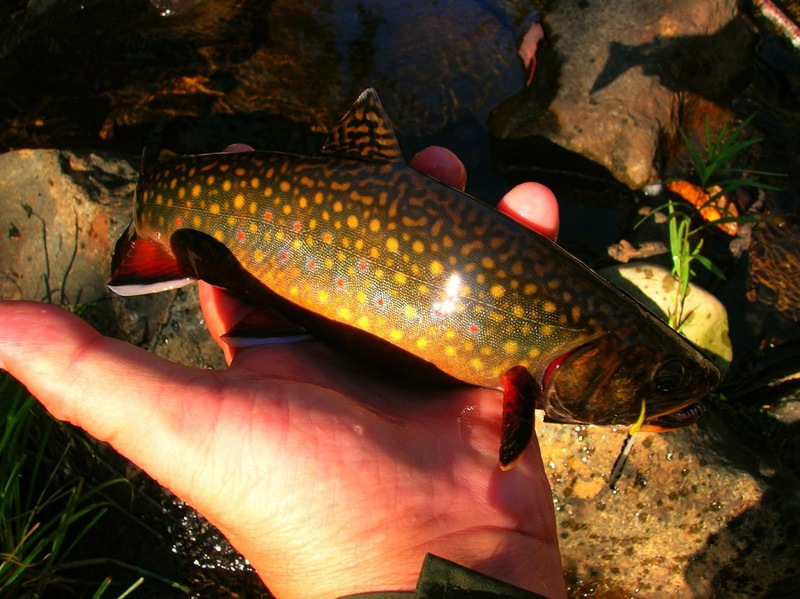 The beauty of a wild brook trout, taken in a cold New England stream on a classic fly is beyond words. As I drove up the dirt road to find a place to turn around I came upon this mountain meadow. Where the tree line begins I know the stream is back there, perhaps there is another brook trout waiting. Yesterday the heat wave broke and the night brought in some cool weather, so this morning I was up at 4 and having some breakfast. By 5 I was on my way to the Farmington River for what I hoped would be a good day. As I arrived at my first spot I gazed upon the water, it was moving smooth and clear. My eyes scanned the water looking for the rise of a surface feeding trout. Although there was not even a dimple I still had a good feeling. As I entered the river I was greeted by that sweet sound of a bald eagle. The massive bird flew low along the water and within a few feet of me he hit the button for more speed and soon was out of sight. I was rigged with a two fly setup 1 spikey and 1 soft hackle. It did not take long before I was hit. The first wild brook trout of the day. The fish was so strong, and darted all over the place. The second place I stopped. The river here is fast and has some wonderful pockets where fish will hold, and that they did until my fly passed by. I caught quite a few in this stretch. This was a very interesting place. The water is very fast a strong here, with some soft water along the side. I worked a Mickey Finn in here a soon I had a good fish on, then off. I hooked another with the same result. I know I would have eventually taken a nice fish on it but lost the fly to an underwater log. I did however hook this wild brown in a soft seam. This wild brook trout was the best fish of the day. He was hooked in the river in the photo below. The last trout of the day. He spit the hook while in my hand, and flipped into the water. I managed to get his photo before he realized he was free. The fly was originated by Mark Libertone to represent the wide range of cream colored insects that hatch through out late spring and summer on the Genesee River. The fly is also an excellent attractor pattern. Hook, TMC 100BL size 14...Tail, White Hackle...Body, Cream Dubbing...Rib, Fine Pearl Tinsel...Wing, Wood Duck...Hackle Cream Hen Back. We have the good fortune of one of the finest tailwaters in the northeast. The Farmington River is a gem but it can get crowded especially on weekends. I have fished certain places on the river where I can find solitude all week, and last Sunday when I drove to that spot there were 3 gents fishing in that sweet spot. So yesterday I drove past the river and fished someplace where I know the crowds are not. I would like to tell you I had a banner day in terms of fish caught but that's not true. The banner was flying in how many were taken on a certain fly. There are times when I'll open my fly box and a certain fly catches my eye, most times I skip that fly and choose another, this day I tied on that first fly. 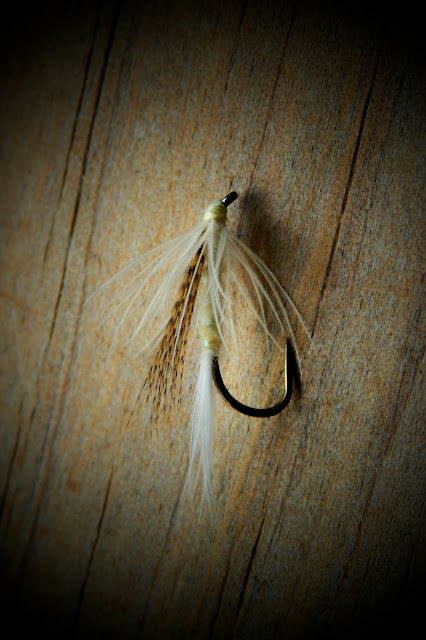 The fly chosen was a size 14 soft hackle dry fly. It gave me the chance to bring a hand full of these guys to hand. They were all about the same size but were a joy on the GCR 3wt. I was also pleasantly surprised to hook this rainbow. Don't know how long it was in the water, but it was some time. It had perfect fins and a gorgeous spotted tail. I found the solitude I was seeking, but one other fisherman showed up later. I think he was a local. These photos are of my many days walking the woods trails in the mountains of Maine. Many of these trails cross some of the most beautiful streams in New England. I can recall almost every brook trout I've had the pleasure of bringing to hand. I can recall all of the places posted here like it I was there yesterday. I hope you will enjoy the magic of Maine's brook trout forest. Lil' Dorothy is a fly that was created by Mark Libertone of Wellsville N.Y. Mark was a fine fly tyer and angler who loved to tie wets, soft hackles and flymphs. I never had the pleasure of meeting Mark but had several conversations with him on various forums and email. When I started tying flies they were simply awful. The feathers were cheap the hooks the wrong style and the proportions were terrible. Mark would always comment that the effort to tie was the important part, and I had that down, everything else could be fixed. He was a part of my inspiration. His soft hackle fly Lil' Dorothy which I have tried to tie to his recipe, a few change were put in for I did not have the material, and I I'm sure Mark would not disapprove, for he was just that type of man. Lil' Dorothy represents the emerging stage of the Little Sulphur mayflies that would hatch on Mark's home water, I believe it was the Genesee River. He commented that these sulphurs had a very distinctive orange body, and it shows well in the material he chose to use. The Lil' Dorothy is a simple fly that has exquisite beauty. Hook, any good wet fly hook...Thread, Cream or White...Abdomen, Pale Orange Embroidery Thread #722," I substituted Pearsall's Orange Silk"...Thorax, Cahil Colored Dubbing...Hackle, Cream or Very Pale Ginger. We have the pleasure of sitting our grand dog "Parker" for a few weeks. It is such a joy just watching him be a dog. One of his favorite things is going for a long woodsy walk and taking a swim in the lake after to cool off. One such walk last week to a familiar place we let Parker lead the way. He soon picked up the scent of some critter and began to look for it in those places where dogs love to go. As you can see the greens were high and thick and Parker's visibility was almost blocked. I soon followed him and he suddenly stopped. At this point I was sure I was going to see a deer pop up, but there was nothing. Parker took some more steps and stopped again, and that's when I saw a tiny stream. I have fished a stream in the area but have never seen this little one that apparently feeds the stream I fish. Glancing into the stream I noticed several brook trout lying over a spring seep. Well brook trout may be good for you but it's not my bag, so Parker say's. And off he went to check out something else. We went swimming, Parker that is and we got soaked from the shake off. After such a workout we were very hungry, and a good lunch was to be had. 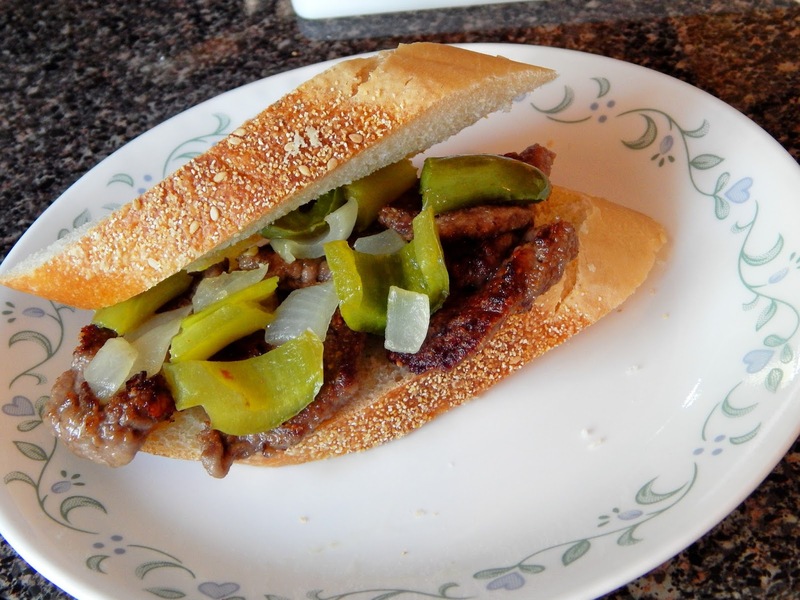 We enjoyed a fried venison sandwich, with peppers and onions. I had the sandwich, Parker requested only the venison. Many times as anglers, small stream anglers especially walk along the stream and find many pools, some large and some small. We find them to be deep as well as shallow, and a combination of both. Sometimes they are almost hidden from view and are only detected from the suns rays glancing of the water. This is the story of one such pool. It lies in a forest of hemlock and thick laurel. The darkness can be surprising even in the high sun. It's waters run clear and cold along a steep side of boulders and a fallen tree. The plunge drops about a foot, and bubbles rise up for a distance. This pool has been here for "well lets say a long time" and has pretty much remained the same. Even in times of low rain fall it maintains it's flow. 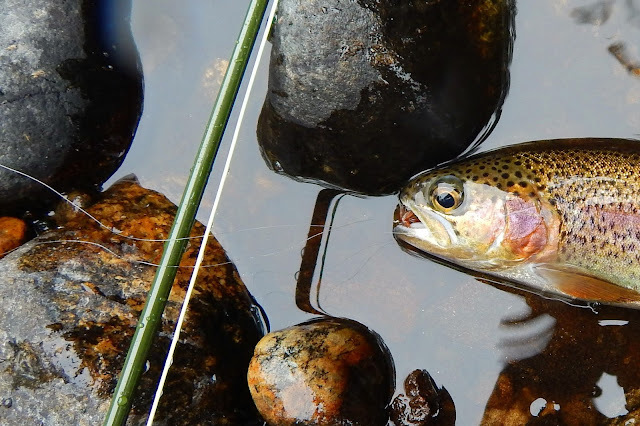 When looking at the pool the angler knows that a trout has to live there, and in is mind is the thought of how to present a fly there to temp the trout. One wrong move and the resident will be gone, he will not leave the pool but will find sanctuary in some hidden corner, for he knows his home well. The angler ties on a black beetle and lets the current move it. The yellow dot is all that is seen. The beetle does not drift an inch when the strike comes, it is fast and the trout is hooked. I was back on the Farmington yesterday morning. The sky was a bit cloudy with some breaks of sun, and a nice breeze kept that cool feel, which was very nice. I was armed with another fiberglass rod that I had purchased this winter, and was waiting to give it a tryout. The rod is a Eagle Claw 6'6" Featherlight, I paired it with a Battenkill reel and a 4wt line. I had purchased this rod for small streams but never tried it on one of them, choosing to break it in on the Farmington. I started on some familiar areas that I know tend to hold brook trout. The set up was a semi- nymph, with a soft hackle trailing about 2 feet behind. It was not long before I had a strike, and a hookup. The yellow stick was awesome in it's debut. Beautiful action with the rod bending like I had hoped for. Some of the trout took the semi- nymph but most took the soft hackle. These fish were fighters and dogged there way going for the bottom, typical fashion for lake brook trout. Another observation I noticed was the humpback on several of the males I took. Soft hackle- North Country fly. What is it with woody debris and brook trout? Find it in a stream and you will usually find brook trout. The Featherlight, Not bad for 29.95. This North Country fly was the winner today. Simplicity to the max. Brown thread body, hares mask for a thorax, and some badger hackle. As I said before some of the males had a slight hump in their backs. I have seen this before in brook trout in Maine, and one other stream in Connecticut. This one appeared to be getting his new fall suit. Sorry for the spot on the camera lens. This brookie had beautiful green highlights. Great outing on the Farmington. A stellar show by the Eagle Claw Featherlight. I give this rod a 9.8 rating. The only thing I didn't like was the ruler on the side of the rod, purely cosmetic, and I can live with that. Fine quality 29.95.